Apple Pie Cupcakes! Fresh apple cupcake recipe with apple pie filling and brown sugar cinnamon buttercream frosting, topped with pie crust cutouts. Created by our contributor, Lauren Kapeluck of EllenJay Events. One of my absolute favorite things about fall is eating pies! Apple, pumpkin, pecan, you name it and I will gobble it right up! So when Carrie mentioned she wanted me to create an apple themed cupcake recipe for November, I immediately thought of apple pie! I am an apple pie lover, especially in the fall. So immediately my mind started going in a million directions about how I would create the perfect apple pie cupcake to share with all of you. I came up with something that I hope you all are going to love and that truly tastes like a bite of apple pie! So here are the details on my new Apple Pie Cupcakes with Brown Sugar Cinnamon Buttercream! 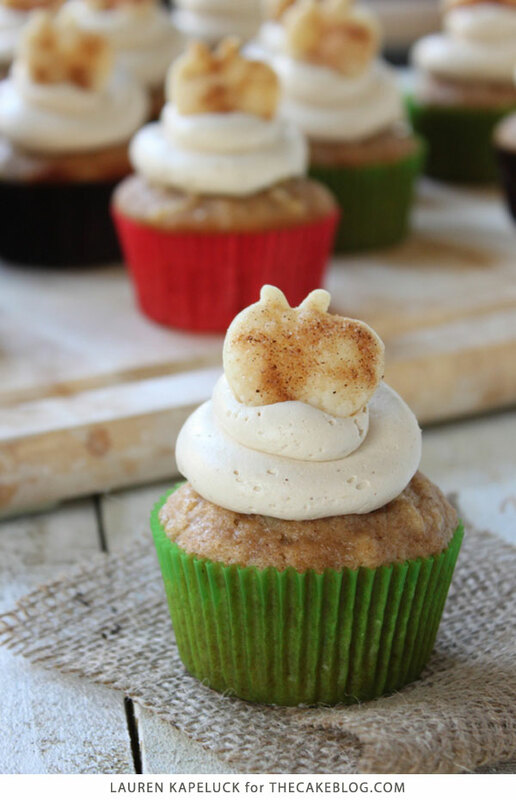 The two key ingredients in these cupcakes are apples of course, and the brown sugar cinnamon flavor that you will taste throughout in every layer from the cake, filling and buttercream. I combined my two favorite types of apples granny smith and gala to create both a sour and sweet pairing in the cake. This batter is super simple to make, using only a whisk to combine all the ingredients with the end result being a super moist and fluffy cake packed full of cinnamon and grated apples to give the cupcake a nice texture. For all you apple pie lovers, not only are there apples in the cake, but there is an apple pie filling in the middle! The hidden pocket of apples is a nice surprise when you take a bite and what truly makes these cupcakes seem like a mini apple pie! To round out the cupcakes I thought a nice swiss meringue buttercream would be the perfect choice since it is light an fluffy and almost resembles the texture of a whipped cream. I used a standard recipe and just swapped out the granulated sugar for brown sugar and added a pinch of cinnamon to carry on the flavors from the cake and filling. To finish off the final look, I used a refrigerated pie crust to create mini apple toppers sprinkled with cinnamon and sugar! This is such a quick, easy and simple way to add some extra fall cuteness to these cupcakes! Afterall, you can’t have an apple pie cupcake without some crust, right? The crust is my absolute favorite part of any pie, and when I was little my mom would actually make my sister and I cinnamon sugar pie crusts for desserts. Rolling out a refrigerated crust she would sprinkle the entire thing in cinnamon and sugar, bake for a few minutes and then slice it like a pizza and we would devour it in no time! If you are looking for a dessert for your Thanksgiving feast this is a great recipe to consider. The cupcakes can seriously be whipped up and in the oven in a matter of minutes. Make them a day ahead of time and store in an airtight container until ready to core, fill and frost and they will be delicious. If the coring and filling of the cupcakes seems like too much extra work, just leave it out, these cupcakes will still taste like apple pie since there is already apple in the main batter. Not a fan of granny smith and gala apples, simply use you preferred apples and they will still be just as good! Preheat oven to 350 degrees and line muffin pans with cupcake liners. In medium bowl combine dry ingredients: flour, granulated sugar, brown sugar, baking powder, soda, salt and cinnamon. In large bowl combine eggs, vegetable oil, sour cream and vanilla and whisk together. Gradually add dry ingredients to wet ingredients and whisk until combined. Fold grated apples into the cake mixture. Bake for 18-20 minutes or until toothpick inserted in center comes out clean. Let cupcakes cool in pans for 5 minutes, then remove to wire racks to finish cooling. Place chopped apples, butter, brown sugar, lemon juice and cinnamon in medium size pan and cook over medium heat for about 8-10 minutes, until apples are tender. Stir occasionally. 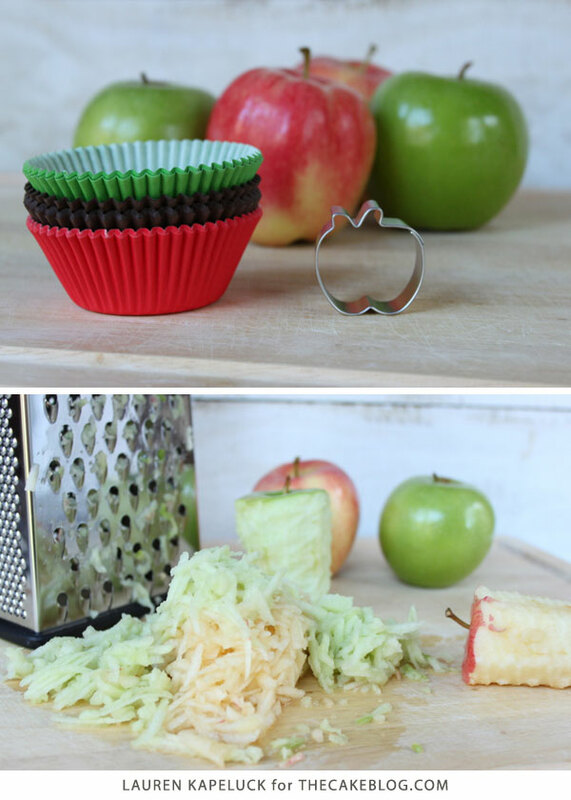 Use an apple corer to remove the center of the cupcakes and fill with apple pie filling. In bowl of stand mixer combine egg whites and brown sugar, whisk until combined. Add vanilla and cinnamon to taste and whip on medium-high until silky and smooth, about 3 to 5 minutes. Place icing in a piping bag fitted with a large round tip and squeeze a dollop on top of each cupcake. NOTE: The buttercream may look like curdled or runny after adding the butter. Keep mixing until it is completely smooth. Bring one refrigerated pie crust to room temperature by sitting on counter for about 15 minutes. Lightly flour surface and roll out pie crust. 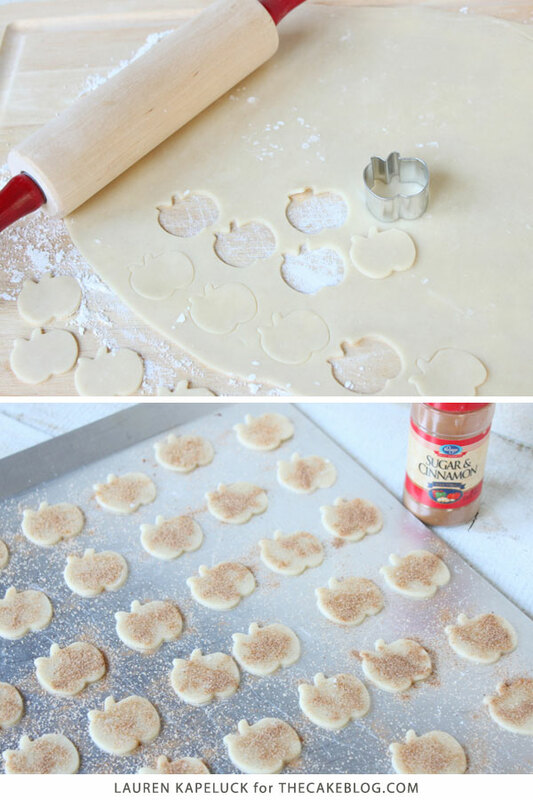 Use a mini apple cookie cutter to cut pie crust toppers. Place on baking sheet and sprinkle with cinnamon & sugar mixture. Bake at 400 degrees for 5-7 minutes. Garnish cupcakes with mini pie crust apples. 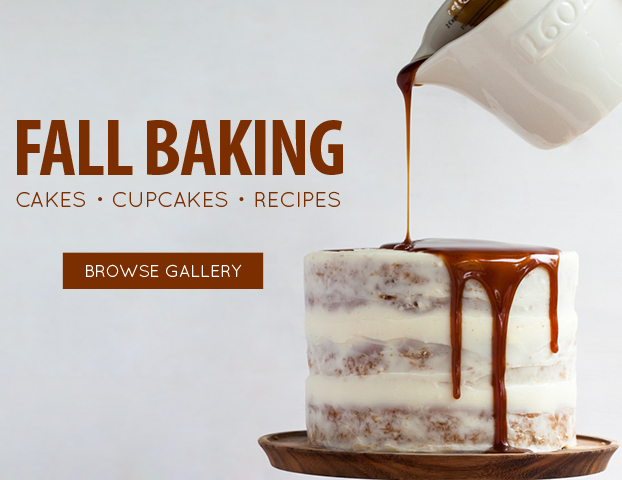 Find more cake recipes, cupcake recipes and tutorials in our Fall Baking Gallery! Wow. Impressive. Look Delicious. Very Creative. Have you ever make these before? Yummy Can’t wait to try these. Maybe Thanksgiving. I will try these for American Thanksgiving that we celebrate here with friends in Montreal !! 🙂 Looks delicious!! I am making these cupcakes as we speak and am wondering how long they will keep once filled and frosted? Thanks in advance for your response – cant wait to try one! I make cupcakes ALL the time. I IMMEDIATELY freeze them (once cooled) and they keep for months and it is amazing how they taste just like the day you made them!! I just made these and they are so good but the frosting came out watery and clumpy. Am I doing something wrong? If your icing looks curdled after adding the butter, continue mixing and it will return to a silky smooth texture. This could take up to 10 minutes as the butter emulsifies with the egg whites. Just keep mixing! If it is too runny after adding the butter, simply refrigerate it for a few minutes and then mix it again. I added a drop of red food colouring to the refridgerated dough and rolled it in before rolling it out. The apple toppers came out a lovely dark red and it helped them to stand out from the cream coloured icing. In America, a pound of butter is sold in a container with 4 “sticks”. Each “stick” of butter equals 1/2 Cup, or 4oz (113 grams). So, for this recipe you would use 1 Cup or 8oz (226 grams). Alright… I don’t give props often, but you, Lady, are a culinary genius! I made these cupcakes for our Court of Honor (along with your recipe for pumpkin cupcakes!) I was mobbed! 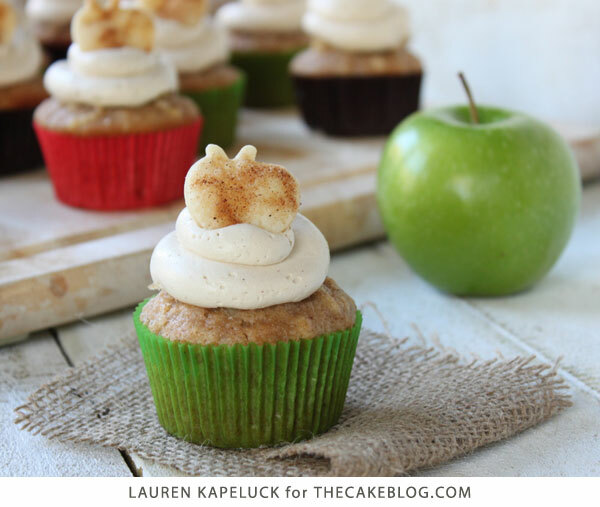 These apple cupcakes are my new go to cupcake for ‘WOW!’ factor! I did change up the frosting ( because I didn’t have time for anything on the stove…) I had to dump ingredients in the stand mixer while I was inspecting scout uniforms and locating my evasive cupcake carrier. Although, I did use yours as my inspiration! 😉 Thanks so much for BOTH of your recipes!!!! since i also did not want to use the stovetop for my icing, i made a simple spiced cream cheese icing. Wonderful, thank you for sharing your cream cheese frosting recipe Jess! Sounds delicious! Can these be kept frozen before frosting but with the filling? If you’re going to freeze, I would hold off on the filling and frosting. Once thawed, proceed with these two steps. Made these and a couple others for a cousins party ..they were the bomb!! We’ve updated the supply list above with a link to a mini apple cookie cutter. Hope it helps! This recipe is absolute garbage. I followed the recipe exactly and my cupcakes turned out disguisting. They werent sweet at all and they taste blander than bread. I cant even swallow them. I swear I followed the recipe exactly and did not leave anything out. I have no clue what i did wrong so im pretty frustrated right now. My guess is there was way too much flour. Hello! I want to make these cupcakes today but take them to work tomorrow. Could I make the filling today and just fill and frost them in the morning? Is this recipe adaptable to a cake form? Yes, you could definitely bake this a cake instead of cupcakes. And we also have a separate Apple Pie Cake recipe that you might enjoy!